Doha, Qatar, 2019-Feb-08 — /Travel PR News/ — Four Seasons Hotel Doha, an award-winning oasis-like property ideally located on a private beach in the heart of Doha’s cosmopolitan city, in partnership with acclaimed Chef Nobuyuki “Nobu” Matsuhisa, announces the return of the legendary Chef Nobu Matsushisa to Doha, Qatar. The exclusive three-day culinary celebration in honour of Nobu Doha will take place from Sunday, March 3 to Tuesday, March 5, 2019. 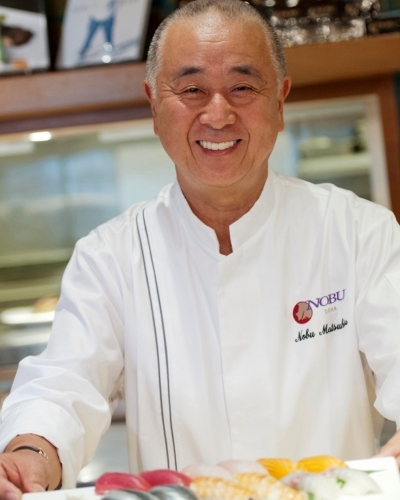 The celebration will kick-off the Qatar International Food Festival, and also coincide with the release of Chef Nobu’s new book – World of Nobu. Sip, savour and celebrate with the culinary legend, exclusively at Four Seasons Hotel Doha. Destined to be the celebration of the year, the Nobu in Town Party – hosted by Chef Nobu – will be an evening not to be missed. Set on Nobu’s stylish rooftop lounge, the party includes unlimited passed Nobu signature dishes and free-flowing signature cocktails, along with live entertainment. The Nobu in Town Party is QAR 685 per person. Savour a six-course omakase menu, curated by Chef Nobu exclusively for Nobu Doha. The special menu features Nobu’s signature new style Japanese cuisine, including such highlights lobster and kohlrabi salad with dry miso, seabass with truffle crust and miyazaki-gyu with tosazu butter and Japanese apple. The Omakase Dinner and Sake Pairing by Chef Nobu is QAR 800 per person, and QAR 500 per person without beverages. Hosted by Chef Nobu, master the art of sushi making from the world-renowned chef in an intimate and hands-on setting. This unique experience is limited to 20 guests and is QAR 700 per person. Located at the water’s edge along the Hotel’s private marina, Nobu Doha showcases Chef Matsuhisa’s innovative signature new-style Japanese cuisine complemented by an equally imaginative setting in the 26,000 square-foot (2,400 square metre) Rockwell Group-designed contemporary restaurant. Offering a truly exclusive culinary experience, found nowhere else, the tri-level Nobu Doha boasts the largest of its kind in the world and is the only Nobu at a Four Seasons in the Middle East. Whether dining at Nobu Doha for the first time or a weekly connoisseur, experience an epicurean journey like no other at Nobu in Town. To make reservations for the events, call +974 4494 8600 or email dining.doh@fourseasons.com. This entry was posted in Business, Festivals and Events, Food & Drinks, Hotels, Resorts, Travel, Travel Services, Travelers and tagged culinary, Doha, Four Seasons Hotel, Nobu Doha, Nobuyuki “Nobu” Matsuhisa, Qatar. Bookmark the permalink.